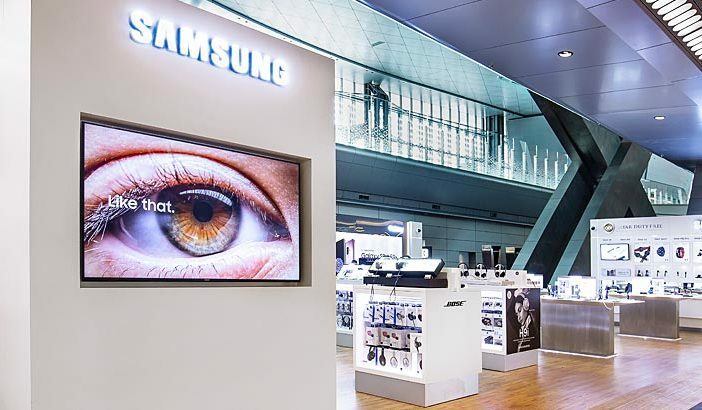 Qatar Duty Free (QDF), in conjunction with Samsung Gulf Electronics, has opened an Experience Zone for passengers traveling through Hamad International Airport (HIA), Qatar, this summer. The Samsung Experience Zone showcases the latest Samsung products available on the market, offering passengers the chance to experience and test the goods for themselves. The pop-up store is in the heart of HIA, on Concourse C.
Measuring 150m2 (1,600ft2), the stand will show the latest cell phones and accessories, including the Samsung Galaxy S9 and S9 Plus, Samsung Note 8, Samsung Gear VR and a wide variety of TVs.